I have stopped the development of my applet MAPresso. First tests with d3.js are promising. A comparison to other classification models. MAPresso is a free Java applet for unclassed choropleth maps and cartograms. Avoiding the problem of fixing (optimal or suitable) class limits, this approach uses a continuous-tone scheme. With the possible exception of extreme values which can fall into two "classes" on either side of the value range, each region has its own specific color value. In the case where an important threshold exists (e.g. 50% "yes" in vote results) there can be set a class boundary for two separate color transitions. 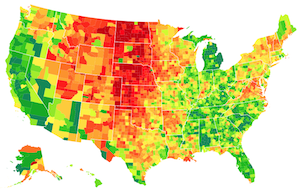 Two and three variables can be visualized simultaneously as bivariate or trivariate choropleth maps using a special color scheme, there is an option for maps with nominal data. 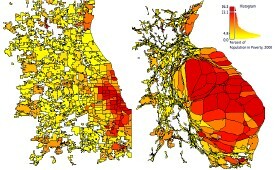 In addition, the areas can be distorted to create a continuous area cartogram. It's an implementation of the algorithm proposed by Dougenik, Chrisman and Niemeyer (1985). Data values can be also visualized as circle cartograms (Dorling 1996), cf. Dorling applet. An additional feature allows a thematic generalization of the map by a simple polygon filter (see Herzog, 1995). The implemented filter is based on a Markov process. Data values can be provided as text files. In addition, the user can enter his own data via the clipboard into a text field. Geometry: Polygons in psc-format (can be converted from ArcGIS shapefiles), circle data as text files. Some data sets are available. Output: An output as a file is not in the focus of the applet, there is a provisional possibility to produce an encapsulated PostScript file (EPS). The distorted geometry of a cartogram process can be exported in ArcGIS generate format.